While the residential developments span a wide range of options, including mid-segment, premium, and luxury housing with 1-bedroom, 2-bedroom, 2.5-bedroom, and 3-bedroom apartments on offer, the industrial warehouse can accommodate a capacity of about 17 trucks at a time, providing inter-facility transfers, dispatches and returns. The aesthetic beauty, quality of construction, superior finish, and high-tech services of the commercial development, will contribute towards establishing it as a landmark in the Central Business District (CBD) of India’s IT Capital. In the midst of a booming new Bangalore, just off the Marathahalli-Sarjapur Outer Ring Road that has information age edifices and cutting-edge infrastructure, Prestige Ivy Terraces offers residential apartments that are immaculate in design - bright, airy, cheerful, and with abundant natural light and cross ventilation, making a home here quite literally a breath of fresh air. With spacious balconies, aesthetically pleasing elevations, and with every home looking on to a vista of ivy-greens, Prestige Ivy Terraces presents a picture of pristine beauty. Prestige Bagamane Temple Bells is situated in the sylvan and sought-after environs of Rajarajeshwari Nagar, Bangalore. Set in nine high-rise towers comprising of 1, 2, 2.5 and 3 bed homes, the property offers a variety of sizes and floor plan configurations to help homebuyers choose the dwelling that most closely aligns with their needs and lifestyle. Another highlight of this property is a plush Clubhouse that provides the best of amenities to fill one’s recreational hours. 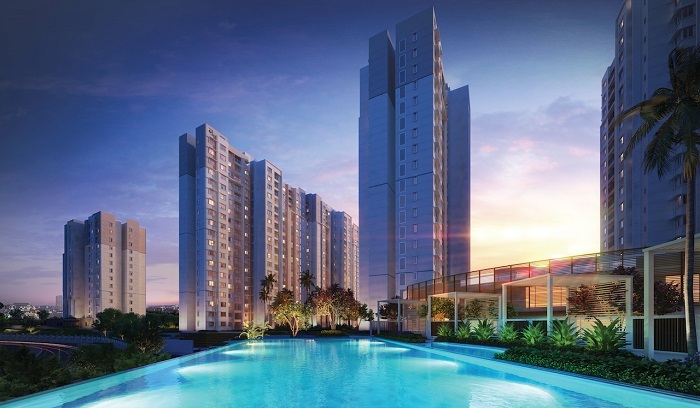 In the heart of Electronic City, Prestige Sunrise Park offers a choice of spacious, brilliantly designed one, two, two bed with study and three bedroom homes, set in 15 Towers spread across 25 gloriously landscaped acres. Promising a life of ease and splendour, Sunrise Park comprises of 2 Blocks – Birchwood and Norwood, that’s home to 1910 multi-levelled apartments. The development is also equipped with every amenity that a modern-day lifestyle demands, as well as a massive recreational area that includes 2 individual Clubhouses. Built on one of Old Bangalore’s landmark sites, Prestige Saleh Ahmed is named after its famed predecessor and is situated at the junction of Infantry Road and Lady Curzon Road. The development has a simple, yet appealing treatment for its external surfaces, combined with the flexibility to fit the requirements of its various clientele / business ventures. It promises open unhindered work spaces within, for flexibility of usage, while each floor plate is designed to support 2 independent work forces with a complete set of services. Prestige Logistics Centre is located in the KIADB Industrial Park, Malur, Kolar district. Abutting the Malur State Highway–85 and situated 51kms from NH -4 (Bengaluru via. Hoskote), it is well connected to the Railway Station at Malur. With a total site area of 62217.92 sqm, the design of the warehouses is fluid ensuring optimal performance and warehousing operations along with the use of high-quality construction materials to ensure an efficient working system. Prestige Group has over 30 years of experience in real estate development and is one of the leading real estate developers in the country with projects in Residential, Office, Retail and Hospitality segments with operations across South India, Pune, Goa and Ahmedabad. It has completed 212 real estate projects with developable area of 84 mn sft. and has 51 ongoing projects across segments, with total developable area of 53 mn sft. It also has 48 mn sft of upcoming projects and holds a land bank of 424 acres with potential developable area of over 42 mn sft. The company has been rated CRISIL DA1 by CRISIL and also enjoys credit rating of ICRA A+. The consolidated turnover of the company for FY 17 was Rupees 4862 Crores and market capitalization of the company as on 31 December 2017 is Rupees 11,993 Crores. Prestige Group, one of India’s largest developers, inaugurated five completed developments under their residential, commercial and industrial verticals on Sunday - 13 May 2018.